The Manson Stage Series M-Jet. NAMM 2017: One of our favourite luthiers, Manson - the UK-based company that makes Muse's Matt Bellamy's weapons of choice - has announced two new affordable, non-Bellamy collaborations with Cort. Following up on 2015's hugely well-received MBC-1, the M-Jet and Classic TC are due to make their debuts in Anaheim. The Stage Series M-Jet retains the Manson MA body shape but adds a 24-fret bolt-on neck, all-new design twin humbucker high output pickups and all-new fretboard inlays. Offered in a Dry Satin Black finish, the guitar will be available in global markets from April/May 2017. 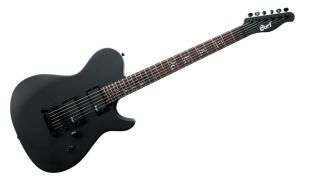 The Cort/Manson-designed Classic TC fuses elements of Manson Guitars from the past with the full body contoured MA shape, giving "the perfect balance of playability and classic design". A new pickup set has been developed exclusively for this model with a versatile tonal range to cover any genre. Available in a translucent Scotch Blonde Natural or solid colour Blue Ice Metallic. The UK retail price will be £469 including VAT, and we're expecting more details and spec to emerge during NAMM, so stay tuned.